I visited the Broadway Farmers Market last week to stock up and explore the potato harvest. Olsen Farms has tons of potatoes. More potatoes than I would know what to do with. Perhaps I’ll write a “What’s the Difference: Potatoes, Part II” soon. That would give me a reason to buy and cook even more potatoes. Like I need a reason. Ha! The guys at Olsen’s were very friendly and helpful as I asked questions about all the different types of tater they had displayed before me. Kindred spirits, these potato growers! 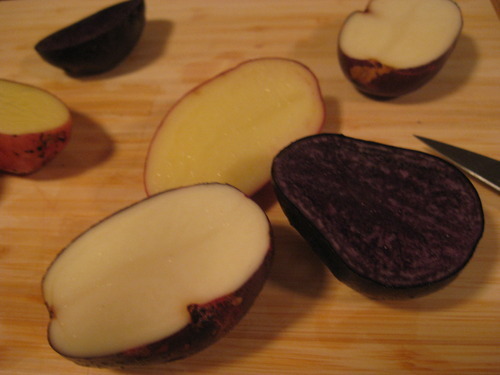 I selected three types: Desiree, a very ladylike and pink skinned all purpose potato; Viking Purple, with groovy purple marbled skin that’s excellent roasted; Purple Majesty, with “intense blue flesh” that is fun to mash. Now it’s time for potato history, courtesy of the knowledgable guys at Olsen Farms, supplemented by Wikipedia. I’ll keep it short. Pay attention, now, this stuff is interesting. Might change the way you look at the humble pomme de terre! 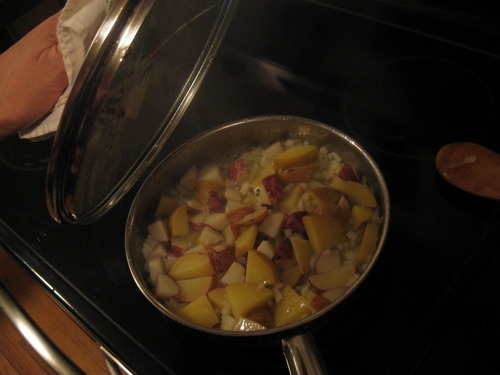 Ok, so how’d I put the mighty tuber to use? All right! First, I chopped them all up. It’s what’s on the inside that counts, right? So the white one is the Viking Purple, the yellow one is lovely Desiree, and the blue one is Purple Majesty. Then, I roasted them all. With oil and salt and pepper. Desiree tasted the best roasted. Creamy, not too dry, held together. 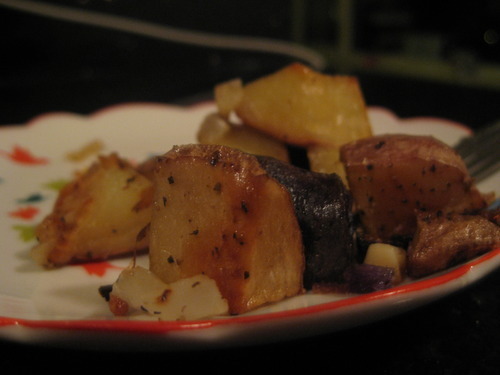 Viking Purple tasted good but kind of fell apart, which is ok if you like softer roasted potatoes. Purple Majesty was a bit dry roasted. All right, then, what’s next? Fry them in a pan and pop them in a frittata, that’s what. I used Desiree and Viking Purple only in this recipe. Cooked them in a pan with some onion until soft, then added some kale. Once the kale cooked down a bit, mixed the veggies with some beaten eggs, added some thyme, and baked. 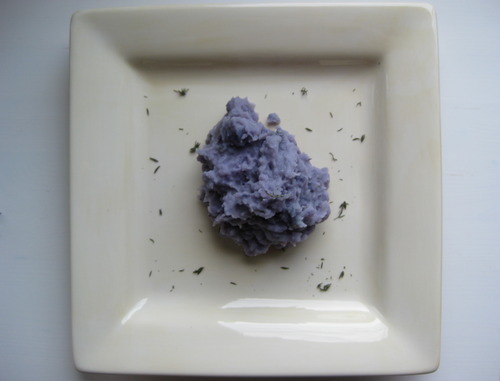 Once again, the Desiree potatoes, which are a little waxier than the Viking Purples, held their shape a bit better, but because this was a soft dish, that didn’t matter too much. Both tasted great, and the different colors of the skin look nice together. And boy is kale good. Okay, here’s my big purple finale. I always buy purple vegetables. I can’t help myself. They look so cool! But sometimes they get less cool looking when you cook them. Remember my ghostly purple pepper? 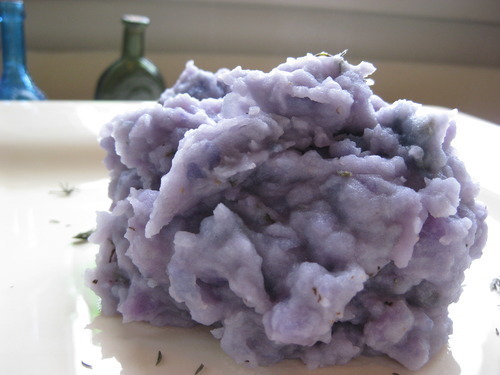 So I was worried about what might happen to my Purple Majesty potatoes when I boiled them. 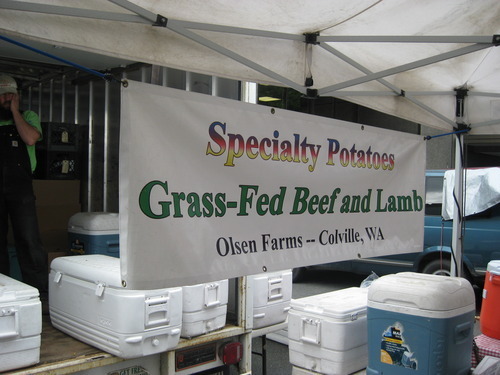 The guys at Olsen Farms assured me they’d make great mashed potatoes, but I was still nervous! So many potatoes in the world. So many delicious recipes. Go find which of the thousands of varieties are grown in your area and do right by your local tater. 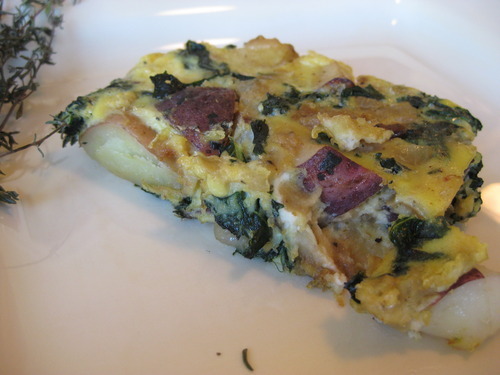 This entry was posted in In the Kitchen (recipes & more) and tagged farmer's market, farmers markets, Lisa Wheeler, local food, potato, potatoes. Bookmark the permalink.